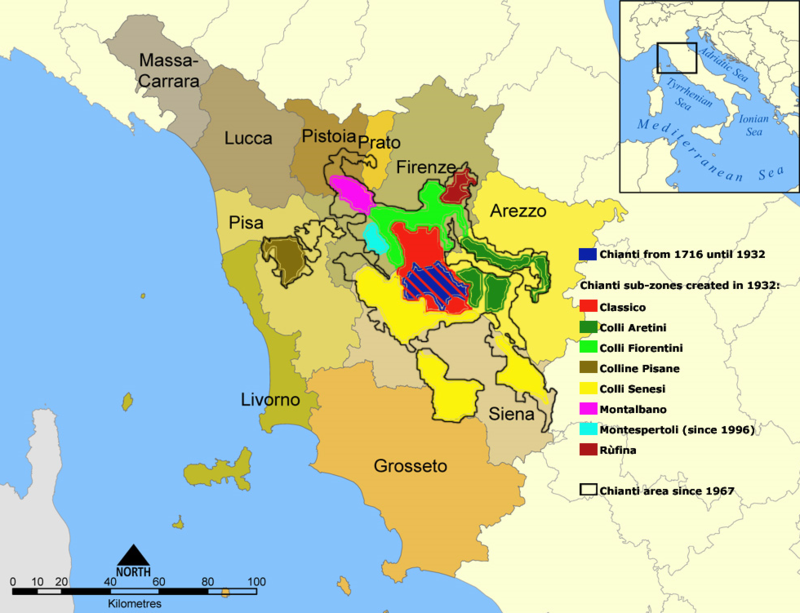 DOCG area for red wine in the Italian region Tuscany, This compared to the "normal" Chianti a level higher wine comes from the classic, dating back to 1716 from the Medici family coming Grand Duke Cosimo III. (1642-1723) defined zone, which was then much smaller. In 1932, other areas or communities were added and completed the current area. The very wooded area covers 70,000 hectares, but only 7,000 hectares are used for viticulture. The suburbs of Florence are in the north, the Chianti mountains in the east, the rivers Pesa and Elsa in the west and Siena in the south the border. The round 70 kilometer wine route "Via Chiantigiana" connects the two cities of Florence and Siena. The area is fully populated by Castellina, Gaiole, Greve and Radda municipalities, and partly by the municipalities of Barberino Val d'Elsa, Castelnuovo Berardenga, Poggibonsi, San Casciano and Tavarnelle Val di Pesa. The Chianti Classico had in the past more and more problems to distinguish themselves from the "smaller brother" Chianti, the two wines were often confused. Therefore, the Consorzio issued some standards to manifest the difference. The basic message is that these are two categories of wine that, despite certain similarities, differ in terms of production, quality and environmental conditions. The two wines may thus consider themselves as independent, even if they open for historical reasons in the only protected origin designation Chianti. The new regulations became valid after a transition period of several years from the 2006 harvest. In the Chianti-Classico area now no more normal Chianti can be produced. Failure to comply with the prescribed yield limits or minimum alcohol content will invalidate the possibility of declassification to normal Chianti (formerly given). The bottling must be carried out within the production area, which otherwise is not required by the Italian wine law for any single wine. The marketing must not take place before the 1st of October of the year following the harvest. The minimum share of Sangiovese was raised from 75% to 80%, and so too varietal wine is permissible. The proportion of other red varieties may not exceed 20%. Mostly this is Canaiolo Nero, such as Cabernet Sauvignon. Merlot and Syrah, The formerly permitted white varieties Malvasia del Chianti ( Malvasia Bianca Lunga ) and Trebbiano Toscano are now prohibited. The permitted maximum yield applies both by plant with a maximum of three kilograms per vineyard, and per hectare with 7,500 kilograms (which corresponds to a total amount of 52.5 hectoliters of wine); the maximum must yield is 70%. The alcohol content must be at least 12% vol and the residual sugar may not exceed 4 g / l. With 12.5% vol and a maturation period of 24 months (of which at least three months in the bottle) he is allowed Riserva call. Riservas are only produced by the best producers in very good years. The best vintages are 1985, 1988, 1990, 1993, 1995, 1997, 1999, 2001 and 2004. At the beginning of 2014, a new three-tier quality pyramid was introduced. The basis is "Chianti Classico Annata". The middle level "Chianti Classico Riserva" corresponds to the "old" specifications. New is the top quality "Chianti Classico Gran Selezione" with a maturation period of at least 30 months (of which three months in bottle), the grapes must come exclusively from the producer. There are even stricter regulations than the Riserva, these are deep red color, spicy persistent aroma, dry balanced taste, at least 13% vol alcohol content, at least 4.5 g / l total acid and at least 26 g / l extract. Retrospectively, not yet marketed wines from the 2010 vintage can be declared with the new quality class. Well-known producers are Antinori, Antica Fattoria de S. Andrea of Niccolò Machiavelli, Badia a Coltibuono, Bianchi Bandinelli, La Brancaia, Cantine Leonardo da Vinci, Carobbio, Casa Emma, Castellani Spa. Castello Banfi Castello dei Rampolla, Castello del Trebbio, Castello di Ama, Castello di Brolio (Ricasoli), Castello di Fonterutoli, Castello di Lucignano, Castello di Monsanto, Castello di Monterinaldi, Castello di Querceto, Castello di Verrazzano, Castello di Vicchiomaggio, Cennatoio, Collolungo, Dievole, Donatella Cinelli Colombini, Fattoria Casaloste, Fattoria di Cinciano. Fattoria di Fesina, Fattoria Le Fonti, Fattoria Viticcio, Fontodi, Frescobaldi, Guicciardini, Il Mandorlo, Isole e Olena, Istine La Massa, Le Filigare, Mangiacane, Mannucci Droandi, Melini, Monte Vertine, Nittardi, Ormanni, Paneretta, Panzanello, Podere Casanova, Podere Il Palazzino, Podere Perseto, Quercia al Poggio, Ricasoli, Riecine, Rignana, Ruffino. San Leonino - Tenimenti Angelini, Tenuta Fontodi, Tenuta di Lilliano, Terre di Melazzano, Valiano, Vecchie Terre di Montefili, Vigna al Sole, Villa Branca, Villa Cafaggio, Villa Calcinaia, Villa Casale, Villa Montepaldi.